Candide: Dearest how can this be so? You were dead, you know. You were shot and bayonetted, too. Candide: I've a sorry tale to tell. I escaped more dead then alive. Cuengonde: Love of mine where did you go? Candide: Oh, I wandered to and fro. Cunegonde: Oh, what torture! Oh, what pain! Candide: Holland, Portugal, and Spain! 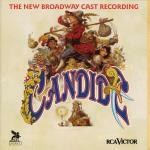 Candide: I would do it all again to find you at last. Both: Reunited after so much pain. But the pain is past. Candide: We are one again. Cunegonde: We are one at last. One again. One at last. One again. One at last. Both: One. One. One. One at last.